For those of you who also follow my Kosher Cooking blog, I apologize. And for those of you who count on seeing only super healthy recipes here, I apologize too. But I just couldn't resist posting these photos here. We have been busy making hamantashen for the upcoming Jewish holiday of Purim. If you have never made these, you should. Now. Read about their history and meaning on Wikipedia. And then hop on over to my other blog to check out the recipe - either this one (especially for Nutella lovers), or this one (if you want a fun, happy version). 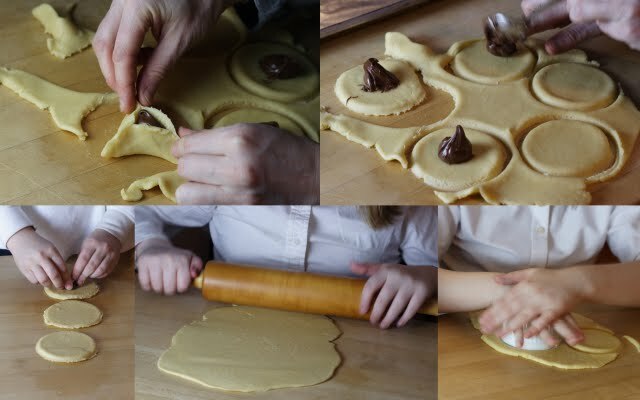 Have you ever made Hamentashen? What do you like to fill them with? colorful "sprinkles" are always fun!!! Love the "star of David" photo! I have had Hamentashen before, but never made them. The ones I had were filled with apple and caramel. They were wonderful! We used to make these every year with my dad. This post just inspired me to text my mom and ask if she knows where his recipe is so maybe we can make them this weekend. I love the sprinkles. I've never heard of these but they look like a lot of fun! I made mine, during the week, and they came out well. I have not had time to blog them. They may miss out. I made a lot of cookies with puff pastry dough. I love your decorations. Delightful. Yay! I love hamentaschen. And these look SUPER festive! OOOOOH YUM!! Send me a few! Your hamantashen look so pretty! And they sound scrumptious with Nutella! You got me hooked when you said nutella...heading over to check out the recipe. these look delicious - anything with nutella gets my vote!